This is the street where the old house was located. This is our lot and more of the street. 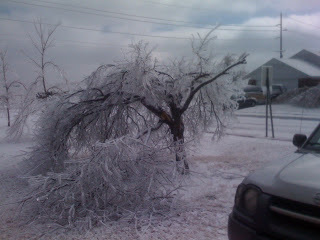 Here are some pictures of Francena's yard and trees in Springdale. At this point our power is on, in Fayetteville, however, it was off for about 3 hours and we are (knock, knock) hoping it doesn't go off anymore. 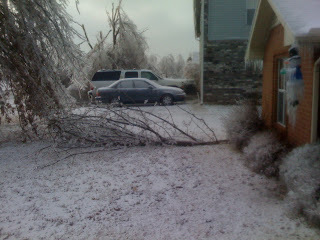 After driving around in Fayetteville and Springdale today, I now know why it may take weeks for people to get power. 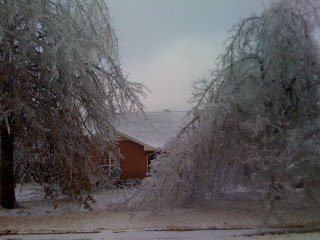 It looks like some crazy ice tornado whipped thru NWA and wiped out all the trees, but left the houses. My guess would be that less than half of the residents and businesses of these big cities have power right now and it may be awhile too... we count ourselves lucky right now (knock, knock). Well, at least the city will be giving out free mulch this spring!!! Stay tuned for video of George!!! I went by Mom's house and this big tree limb fell just inches from her roof. It had not been there about an hour before. Mom's red bud tree in the front. Probably not going to make it. This is the view of Mom's house from the street. 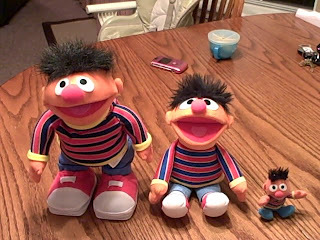 Here is our first attempt to download from the new video camera. Hope it works! This is Becca dancing and playing with her Little People SUV that Santa left her. I swear, we didn't prompt this at all. She just played the song and got up to dance. Now she does it every time. It's hilarious! Here are some pictures from our Christmas at home. We opted to stay in Fayetteville, so Santa could catch us at our house. Then, we went on to Wynne the day after Christmas to see our other family. Becca learned how to say "Santa" and "snowman." She was thrilled that Grammy had about a million snowmen for her to play with! Here is the loot after Santa had stopped by. 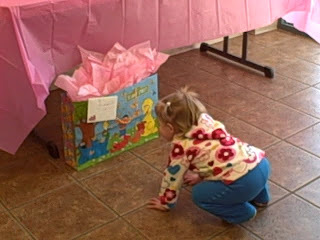 As you can see, Fergie was trying to get her gifts! Becca had fun playing with her new baby and her stroller for it. Grandma had to help Becca empty out her stocking. The first thing she pulled out was a book, and immediately stopped so Grandma could read it to her. We were happy that Grandma Francena spent the night with us so she could enjoy this with us. Fergie is proud of her fancy treats and her new ball that Santa brought her. This is Becca in her Christmas dress that Ashley got her. She wore it to church the Sunday before we left. 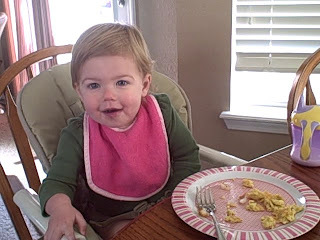 She was quite the little priss.